Ugh, it’s Christmas again? Being from a small—almost non-existent—family, banquet dinners, cheesy holiday sweaters, and mistletoe awkwardness all seem like something out of a bad movie to me. Christmases in my household were depressingly casual: five-minute gift exchanges next to a three-foot plastic tree. In elementary school I had the shocking realization that Christmas cheer is not just straight-to-DVD fodder and is very much real. This year, at least for one weekend, I joined in on the festivities and found that the holiday spirit—or at least some benign sense of it—was only a Netflix subscription away. I wouldn’t have been doing it without a shred of irony. While “Bad Santa” seemed like the front-runner for someone as young and disillusioned as myself, I chose to watch “Santa Buddies” instead. 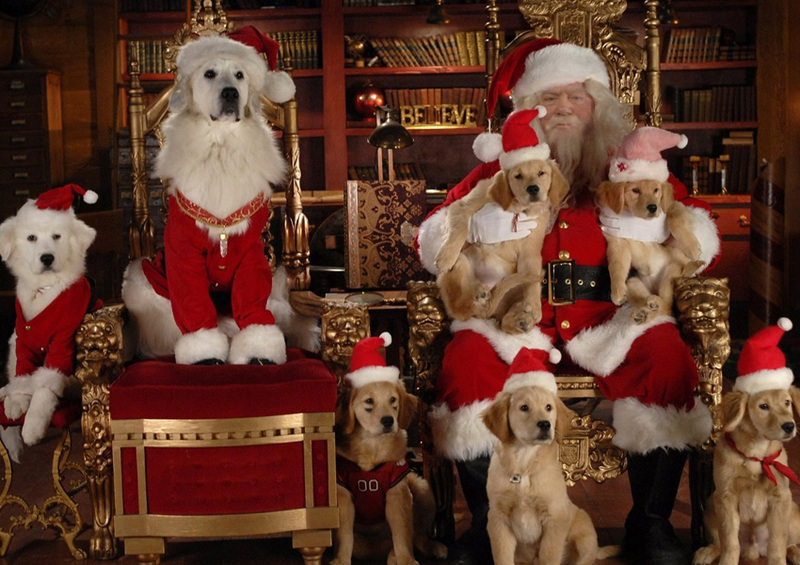 Directed in 2009 by Robert Vince, the film follows a ragtag team of golden retrievers called the Buddies in their quest to save Christmas. I distinctly remember a period in the early-to-mid 2000s where talking dog movies had their peak. The trend started with “Air Bud” in 1997, and then resurfaced with 2001’s “Cats & Dogs” blockbuster. Netflix is now littered with countless spin-offs and cheap imitations. It turns out that Vince is a huge fan of the style; his filmography is almost exclusively about golden-retrievers, with the exception of two films, both of which star chimpanzees instead. “Santa Buddies,” being one of his fairly later films and the first in a trilogy of tail-wagging Christmas films, showed great promise—at least for my purposes. From the opening credits I was reminded of those days in elementary school, usually before our holiday break, when our teachers would sit us boy-girl-boy-girl in the auditorium to watch some awful children’s movie. Through and through, it was a derivative Christmas movie, packed to the brim with monologues about the importance of altruism and family—the same ones that made me cringe in elementary school. Nevertheless, I liked a few things about “Santa Buddies.” One of the pups, suitably named Buddha (voiced by Field Cate), had a couple lines about metaphysics that I found kind of funny. In his first scene he pondered, “Your material desires are those of the wanting mind. Enough is never enough.” The script, written by Vince and co-writer Anna McRoberts, had some other moments that I really enjoyed, such as the almost philosophical ways in which the dogs debated Santa’s naughty list and whether or not it was just a way to scare them into behaving. Abstract concepts aside, Christopher Lloyd of “Back to the Future” fame also had a fun performance as Stan Cruge, a dog catcher who has spent every Christmas sending pups to the pound. Still, I found little else that would persuade me to watch the film’s follow-ups, “The Search for Santa Paws” and “Santa Paws 2: The Santa Pups,” both of which are conveniently on Netflix. Honestly, I wasn’t entirely sure why the film was panned. 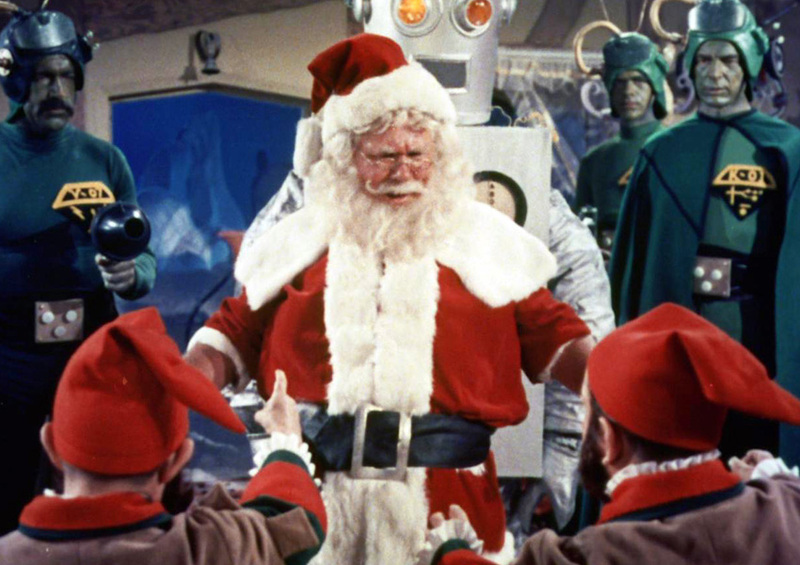 “Santa Claus Conquers the Martians” was one of the more decent films that I’d seen all year. Written by Paul L. Jacobson & Glenville Mareth, the script had a distinct flair—somewhat ahead of its time, in fact. The concept of the film was that the children of Mars had no interest in anything but the television programs they got beamed up from Earth; to teach them to how to have fun the head Martians concocted a scheme that lured Santa to their planet. I found it cool that even in the ’60s people had the same fears about technology that they do today. Chochem, an ancient Martian sage, noted, “We have no children on Mars. They have children’s bodies, but with adult minds. They do not have a childhood. I’ve seen this coming for centuries. They are born. Our electronic teaching machines are attached to their brains while they are in their cradles. Information is fed into their minds as a constant stream. And by the time they can walk, they are adults.” To juxtapose that threat, Vincent Beck played Voldar, an alien who thought kids would become too much of a nuisance if they had time to play and explore. Beck’s performance as a disagreeable jerk—and ultimately the film’s antagonist—was definitely a standout. As the film progressed I was more allured by its bells-and-whistles than any of the themes or actors. The universe of “Santa Claus Conquers the Martians” was very idiosyncratic. The characters had great use of similes such as “like looking for a speck of space dust in a comet’s tail,” which really added to the world-building. Jacobson and Mareth also had a few moments of brilliance, such as a scene where a couple of parent aliens were seriously distraught over their kids not wanting any of the delicious food pills they’d brought home (hey, it comes in the flavors of hamburger, buttered asparagus, mashed potatoes, and chocolate layer-cake). Granted, the film wasn’t very memorable outside of that. I’d already forgotten a lot of film’s pivotal moments—despite only having seen the movie a few hours ago—but it wasn’t the chore that I’d expected it to be. At that point I was pretty much done with my short foray into the Christmas spirit. 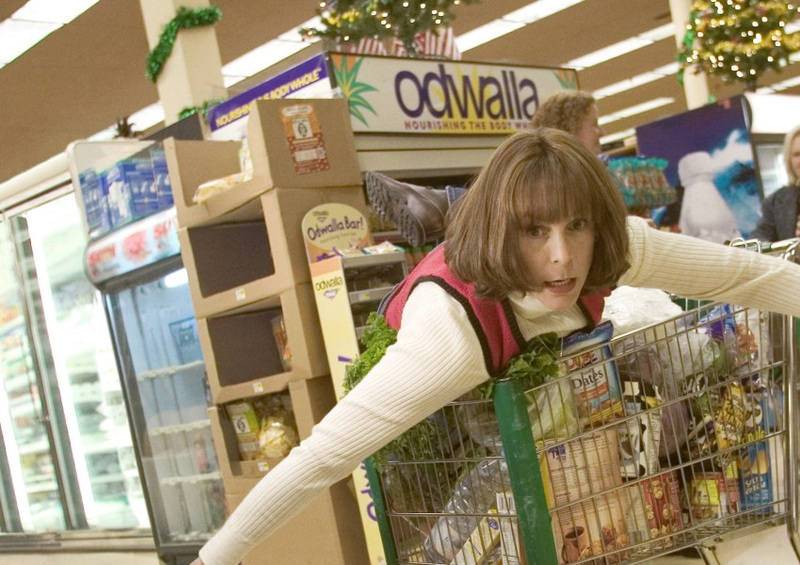 Holiday movies I’d seen all had a tendency to be spectacularly one-dimensional. As I fought the urge to just wrap up season six of “Grey’s Anatomy,” I figured I should at least watch one last film to wrap up my expedition (and then I could get back to worrying about Meredith and Shepard’s relationship problems, guilt-free). It was pretty much up to Netflix to decide what I’d be slumming through for the next hour or so. As faith would have it, “Christmas with the Kranks” was one of the first things to pop up. I figured it was destiny as Tim Allen has been coming up in a lot of my conversations lately. Now, I’d seen the movie before, but remembered it much differently. All I really recalled was Allen doing something stupid, albeit holiday/family-related. The official Netflix synopsis for the 2004 film sung a different tune, however: “When Luther Krant and his wife opt to skip Christmas—no tree and no rooftop Frosty—can they handle the fallout from their family and neighbors?” As someone in that same situation, I was actually excited to start the film, which was also manageably short. With their daughter out on her own, the Kranks (played by Allen and Jamie Lee Curtis, who looked nothing like the Activia spokesperson she is today) decided to take a Caribbean cruise instead of throwing their usual Christmas party. In response, the neighborhood began to riot, a counterattack spearheaded by Vic Frohmeyer (Dan Aykroyd), who was the community hotshot. I found the first half of “Christmas with the Kranks” surprisingly great—its 5% rating on Rotten Tomatoes completely unwarranted. It was pretty funny how Mr. Krank kept a ledger for much he and his wife had spent last Christmas ($6100, with an additional $63 spent on ornament repair). The first act definitely showed how intrusive the holiday is to people who don’t celebrate it. Allen’s character literally had to print out notices to tell his colleagues that he was in total boycott of Christmas (save for the charitable donations that his wife convinced him to make) and wouldn’t be accepting any presents and pleasantries. Shockingly, the Kranks eventually became front page news, which would never happen in New York—where I’m writing this piece from—, unless someone burnt their house down, or mugged them, or something. These were the scenes that I hadn’t remembered and actually enjoyed, but then came Frosty to rain—or snow, I guess—on my parade. Inevitably, the neighbors decided to help the Kranks throw the party after all, which led to a whole thing where Tim Allen falls from a rooftop after a botch attempt at hanging Frosty, a trademark snowman figurine that everyone was super ecstatic about seeing. The memory gave me goosebumps. I had seen “Christmas with the Kranks” in elementary school. There I was, in bed years later, being reminded of Liridona, my first ever crush. I sat right next to her, having mastered the pattern of boy-girl-boy-girl. We both cringed at whatever-the-hell was happening with Daddy Krank. Last period—lunch—I had won in an arm-wrestling competition with a boy named Christian. He was fat and flaunted his Gameboy, the Christmas present he got early this year. I hated him; he hated me; we both “loved” Liridona. For beating him, he let me take a shot at courting her. I remembered Dan Aykroyd shouting for help, and me nudging Liridona to try talking to her. She told me to shut up. “Christmas with the Kranks” resumed; Mr. Krank gave away his Caribbean cruise. Years, years, years later, I shed a tear at the film’s closing act. The idea of “Christmas in community” was still super corny to me, but I wouldn’t have been doing this without a shred of sentimentality. If you think that means this piece will close with me—the blond-haired Grinch—telling you that the Christmas spirit is very much alive in all of us, and sometimes it takes the adolescence awkwardness to remind us of that, I’m going to do no such thing. There were no cheesy holiday sweats or banquet dinners in my apartment; there wasn’t even a three-foot plastic tree. After the credits for “Christmas with the Kranks” finished rolling and I was sent back to the Netflix homepage, my mom walked in the room. She saw I was somber—more so than usual. “Why are you watching these god-awful movies,” she asked me in Polish, seeing my “Recently Watched” list. There was no other family over and gifts had been exchanged in advance. In some benign sense of Christmas spirit I asked if she wanted to watch “Grey’s Anatomy” with me.